Fall and winter get us thinking about evenings curled up with a book or playing a game of Pictionary with the family. Pair these activities with the crackle of a fire. You won’t want to waste fuel up the chimney, so take advantage of new technology that allows for more earth friendly fireplaces. With so many options available, one of the first decisions to make when you shop for a new unit will be to choose between gas or wood. 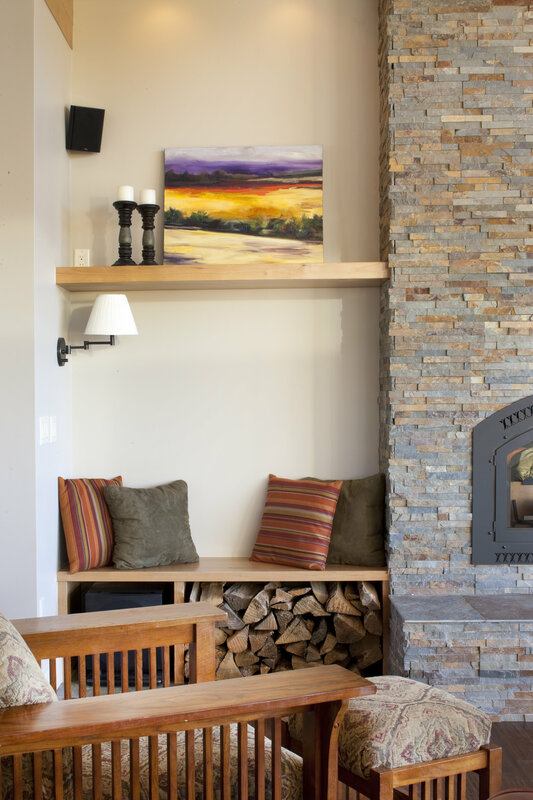 Many people like the ease of a remote-controlled gas fireplace. Others enjoy chopping and stacking windfall branches. A geologist client of ours chooses to burn wood (a renewable resource) rather than natural gas (a fossil fuel). But in order to reduce particulate pollution, many municipalities limit the installation of new wood burning fireplaces. Check with the local building department before buying. Some cities such as Boulder and Winter Park, Colorado, allow one new EPA qualified wood burning fireplace per residence. These units reduce the soot output, eliminate back draft down the chimney, and vent more of the clean heat into the room. Some applications are listed for a federal tax credit. We at Lawrence and Gómez Architects have included the efficient wood burning Fireplace Xtrordinaire Elite in several projects. To see more photos of the room shown at the top click here. For more photos of the room above click here and for a published article about it click here. Other brands also make EPA qualified models such as Lennox and Industrial Chimney Company. For more information on efficiency and tax credits click this link to Burn Wise.